This summer when I (Stuyvesant High School '11, New York) came to India to volunteer with DSF for three weeks, I arrived with more of an idea of what to expect, and how to approach the teaching style. Last summer I had volunteered in the same school, the Rajajinagar Government School, for a shorter period of time, and during that time I became familiar with the environment of the school and its English level. 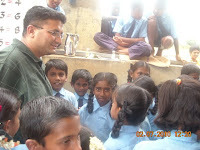 To read about my 2009 experiences, you can visit: http://dreamschoolforum.blogspot.com/2009/10/seeing-india-in-new-light-summer.html. When I arrived in July with my friend Lily (Stuyvesant High School '10, New York), we came with ideas for interactive and fun lessons for teaching the students conversational English. And I also came with one other objective in mind: to teach the kids how to read. Last year, lesson after lesson I saw the students mindlessly copy words into their notebooks and recite their meanings, but the pronunciation of each written word came straight from memorization, not phonics. While I understand the importance of conversational English (the most practical application of English for them), I thought it was equally important for them to learn how to read so they could better understand their lessons and read signs they see all around them. Being able to teach the same classes that I had done last year was very exciting. When I walked into the school on the first day, I was elated to see so many kids rush to me and say Hello Shilpa Ma’am. The classrooms were freshly painted and there was some construction taking place, but other than that, not much had changed. We were teaching the 5th and 6th standards, and to get them to learn how to read, our first lesson was phonics of all the different letters in the English alphabet. Most students picked it up very quickly, however, the teaching was a challenge because students were at very different levels from one another. Some students picked up their phonics within 20 minutes and others were still struggling to identify their ABCs. In the middle of our three weeks there we decided to split the classroom into two groups, one of them more advanced than the other, so we could increase the pace of teaching. Overall the reading lessons went over very well. We started with the sounds of letters and different letters that go together, and eventually we started writing simple words and combinations of letters on the board so the students could put the sounds together. In the final week I took some select students who were doing very well in their reading aside to read a Dr. Seuss book with me. It was very exciting to see the amount most students had progressed in the three weeks we were there. The classroo m setting also fostered a friendly competition and students wanted to be able to do as much as their classmates so they would also help each other with the studies as well as with communicating with me and Lily when language proved to be a barrier. Aside from reading, we also had many interactive lessons that helped the students in conversational English. At the end of their two weeks they each made an About Me book out of colored paper, and within it they asked questions (such as How Many Brothers and Sisters Do I Have?) and answered them with pictures to supplement their answers. 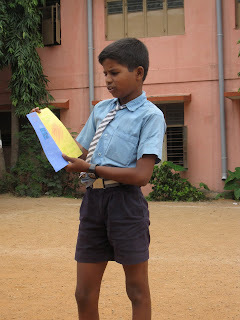 When they had all finished their books, we took them outside and they each presented their project to the entire class. We also taught them about the different states of weather, and every day they would tell us what type of day it was. We had them make drawings of the different types of weather and write out sentences describing what they had drawn. Because this was earlier in the three weeks, some understood what they were writing, while others didn’t. Outside of the classroom I got to know the students well too. We would someti mes arrive early and play with the students, and they taught me some of the games they play (like kabaddi, and a game that is like the American version of Hopscotch). One student would, every morning, look at my watch (an analog) and then look at Lily’s watch (a digital) and then look at his own watch (a digital) to make sure that the times matched up, and then in English would report to us what time it was. Another student would show us different things that he found and we would teach him the English words for them so he knew. It was good to know that the students felt comfortable with us because they knew that we had energy and enthusiasm, as well as a lax attitude to teaching. On the last day we asked each student to make a drawing of what he or she wanted to be when he or she grows up. As the culminating lesson, we felt that this really lets the kids open up and be creative. While some students copied what their neighbors were doing because they liked the idea of it, others said things like they want to be a teacher, a policeman, an artist, a singer, a dancer, a pilot, and even an astronaut. When we were leaving they all asked me if I would come back soon. Outside of teaching in Rajajinagar, Lily and I also had the opportunity to teach in a computer lab in a government school in R.T. Nagar. The computer lab was sponsored by the government, but was hardly being used because there weren't any teachers experienced beyond the applications Microsoft Paint and Microsoft Word. We were very excited about teaching computers, however, this did not work out as planned because of the recurring power failures. Lily and I were able to visit DSF’s rural center and see the rural schools that DSF sponsors. It was a unique experience having had little exposure to villages in India. The schools in the village were very nicely painted, and the students were very welcoming. In one of the schools that we visited, some of the students performed the dance that they had practiced for the DSF annual day. In another school, the younger students sang English rhymes that they knew. The three weeks that I spent this year at the Rajajinagar school and with DSF were amazing and unforgettable, and as I promised the kids at Rajajinagar, next time I go to Bangalore I will surely go visit. A special thanks to Maitreyee and Bhagya for making it happen and assisting us in our time there, as well as the Rajajinagar school, for welcoming us and letting us teach there. And thanks to the staff of DSF – I hope to be back in Bangalore soon! Sackhumvit Trust and Dream School Foundation (DSF) have collaborated to develop rain water harvesting (RWH) at government schools associated with DSF’s Holistic School Development Program (HSDP) . Several of these schools are situated in peri-urban locations that are burdened with an inadequate or unsustainable supply of water. More importantly, these schools have basic RWH facilities in place from the Karnataka state government’s scheme, Suvarna Jala (2007). This infrastructure, however, has deteriorated overtime due to a lack of community ownership. Examples include poor quality engineering and construction of RWH facilities, poor maintenance or theft of key structural items (i.e. piping, taps, filters, water sump, etc. ), and limited awareness amongst school members about the use and maintenance of RWH . Sackhumvit Trust and DSF are interested in reviving RWH at these schools through investing in pending infrastructure requirements, and raising awareness on how to effectively utilize and maintain this resource. Sackhumvit Trust and DSF hired HINREN Technologies Pvt. Ltd. (“HINREN”) to build RWH facilities at a higher-primary government school in Nelamangala (Nursapura Ramanagar District, Magadi Taluk, Solur Hobli). While the Higher-Primary Government School has basic RWH facilities in place from Suvarna Jala, this structure is incomplete and dysfunctional; lacking sufficient piping, a filtration system, and an adequately sealed water sump. 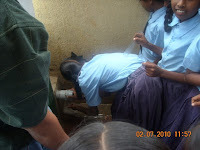 Moreover, the school is burdened by a severe water crisis as its local borewell is completely dry, compelling staff and students to walk 10-15 minutes to collect water from the closest functioning borewell. The school is unable to provide potable water for its students, who must carry their own drinking water to school. 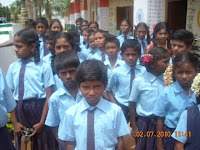 HINREN technologies completed construction of RWH facilities at the Higher-Primary Government School on May 25th, 2010. The construction was completed just in time for the school to harvest rain during the monsoon seasons. Sackhumvit Trust and DSF also organized workshop on July 9th, 2010 at the Higher-Primary Government School to raise awareness amongst teachers and students about the benefits and maintenance of RWH. The workshop was conducted by Mr. Sunil from HINREN, who discussed the importance of RWH, and how to maintain the RWH facilities recently constructed at the school. He also shared interesting facts such as how many liters of rain water can be collected based on the surface area of the school’s roof. 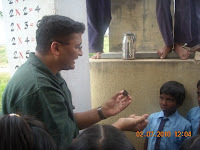 Mr. Sunil performed a drinking-water quality test, and explained how to purify harvested rainwater so that it is potable. The workshop was well-attended with a total of five school staff and 30 students participating in the program. Teachers at the Higher-Primary Government School, who had earlier expressed that they knew very little about RWH, found the session to be informative and practical. During the workshop, Mr. Sunil worked out a schedule with students who divided various maintenance responsibilities amongst themselves, such as flushing out stagnant water in the collection pipes, and cleaning the roof once every two weeks an the water sump once every quarter. The main discussion points of the workshop are summarized in the following sections. RWH is the accumulation and storage of rain water. RWH can be used to provide drinking water and water for live stock, irrigation, and water to refill aquifers in a process called ground water recharging. Rain water can be collected from the roofs of houses and other types of buildings, or from water sheds (generally found in rural communities). In some cases, rain water may be the only available and economical water source for a community. Household rainfall catchment systems are simple to construct, relatively inexpensive, and are successful at most locations with average rainfall greater than 200mm/year. Roof rainwater is generally of good quality and may not require treatment before consumption, as long as the roof is regularly cleaned. However some rooftop materials may produce rainwater that is harmful to human health. Acid rain is generally not a problem for countries located in the sub-tropics, close to the equator, as the circulation of air prevents the concentration of air pollutants. 1. Clean the school roof thoroughly one every 15 days. 2. Clean the water tank once in 3 months, and keep the tank closed tight. The water sump should not be exposed to any sunlight or dust, and should be sealed air tight. 3. Flush the tap everyday in the morning to clear dirty and stagnant water stored in the collection pipes. 4. Change the coal in the filter once in two years, as dust particles can settle on the coal and will eventually contaminate harvested rainwater. 80*20 = 160 * 20 liters of rainwater per square foot per day of heavy rain. = 3,200 – 10% of water waste. An important aspect of RWH quality testing is to determine bacteria contamination. Bacteria can develop if water is exposed to contaminants (such as dust found in the water sump or roof), and adequate sunlight and air. For this reason, RWH sumps are often sealed to avoid light exposure and are regularly cleaned. 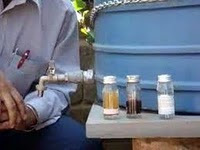 Nonetheless, it is important to regularly test harvested rain water for the presence of bacteria, especially if RWH is being used to collect potable water. 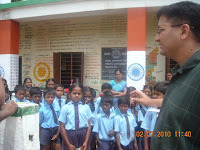 Mr. Sunil advised teachers and students to clean the school’s roof once every 15 days, and the water sump once quarter. He also encouraged them to test for the presence of bacteria in harvested rain water once every quarter while cleaning the water sump. The H2S Strip Test is a ready-to-use, simple device that measures the presence of bacteria by detecting the presence of hydrogen sulphide (H2S), a chemical produced by bacteria during decomposition of organic material. The test involves a sterilized paper strip treated with Agar base. This compound is manufactured in a lab with some food particles and proteins, and is then stored in a sterilized glass bottle. Upon filling the glass bottle with a water sample from the water sump, store the bottle for 24-48 hours at room temperature (25-37 degrees Celsius). If bacteria are present in the water sample, they will produce H2S during their decomposition of the paper strip, which turns the water sample black in color. 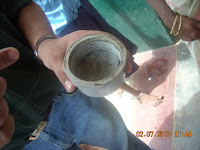 This means that harvested rain water is not potable and hence students and teachers should not drink this water. 1. Ready-to-use: The water sample (20 ml) from the source can be directly placed into the glass bottle. The paper strip in the bottle is already coated with the Agar base, so no further preparation and sterilization of the glass bottle is required. The water sample does not need to be treated before placed into the sterilized glass bottle. The bacteria test can therefore be conducted directly at the water source (i.e. at the water sump). 2. Simplicity: The H2S strip test–kit is so simple to use that anyone can perform its water-quality test. For the reason it is most suited for rural locations where there is inadequate infrastructure and resource persons to conduct a thorough laboratory test. 3. Economical: The H2S strip test–kit is very economical, as it does not require laboratory services and the materials for the test-kit are readily available and cost-effective. 4. Portability: The H2S strip test–kit is made up of glass, light in weight, and easy to carry anywhere. Disposable: The H2S strip test–kit can be easily disposed after use. 5. Confidence: The H2S strip test–kit’s results are reliable, meaningful and reproducible. 6. Illustrative Direction: The H2S strip test–kit includes easy-to-follow, illustrative directions on how to use the kit. 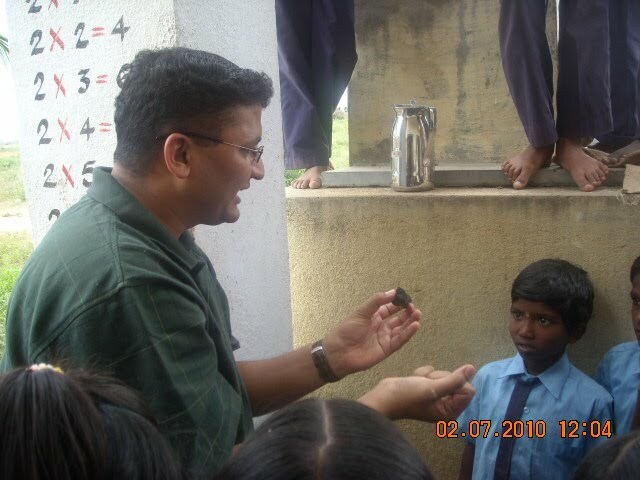 Mr. Sunil left ten sets of the H2S strip test–kits with the Higher-Primary Government School. This would enable them to regularly test the quality of harvested rainwater to determine if it is suitable for drinking purposes. How to purify the water? If the rain water in the H2S glass bottle turns black, the water is not fit for drinking. In such case, take an empty, clean, and transparent plastic bottle and fill it half-way with harvested rain water. 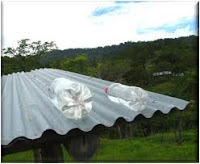 Place the plastic bottle on a flat roofing steel sheet, as shown the picture. Leave the bottle under the sun for three to four hours. This will kill any bacteria that are present in the water, and the water will be ready to drink. Alternatively, harvested rainwater can be made potable by boiling the water.